Not all wood finishes are compatible with each other. This is something that you must pay attention to. If you don’t, you can undo all your hard work. Many cabinet manufactures use lacquer or catalyzed varnish as a finish, but this will limit your choices. While the finish is durable and crystal clear, it can also be very glossy and tough to work with. This will present challenges for any cabinet refinishing project, especially if you don’t plan on fully stripping the existing finish. A good rule is polyurethane over polyurethane only. It may or may not be compatible over all oil or water-based stains and isn’t compatible with varnish or acrylics (though there are commercial acrylic urethanes). Many stains today are oil based, so if you plan on using polyurethane, use oil based stain. Clear polyurethane is compatible with common oil based stains. You’ll also want to remember that polyurethane tends to change colors over time, they turn slightly yellow, though Varathane brand’s Diamond finish is clearer than some of the other polyurethane finishes. If you want a bright look, then water-clear lacquer may be your best choice, even if it is glossy and hard to apply. 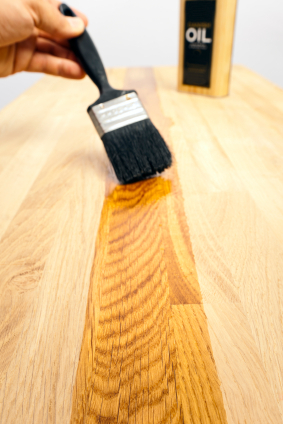 Polyurethane tends to trap air bubbles, so it is important to stir gently if you choose a semi-gloss formula. Varnish can be applied over everything else, but you do need to pay attention to what type of paint or varnish you used. Some water base products can be applied over oil base finishes, but this is risky. You need to read labels carefully. The best advice is to avoid mixing water-based clear wood finishes with oil-based finishes. Varnish is a great finish that dries hard, with excellent adhesion to most surfaces. It is also easy to apply with a HVLP spray gun and flows smoothly from a brush. A HVLP (High-Volume Low-Pressure) spray gun is specially designed to deliver high paint/finish volumes without requiring high pressures. This is important because you don’t want air bubbles to form in the varnish as you spray it on. There are many types of water-based clear wood finishes available. The most common is acrylic urethane but water based polyurethane and spar varnishes do exist. Acrylic urethane is a great finish to use as it dries to a tough plastic like coating and is mare resistant. But it isn’t always compatible with oil based finishes. While there are incompatible clear wood finishes, if you pay attention to what type of stain or previous finish you used, you should be able to achieve the results you desire.